I was impressed with the burritos from Sal Y Limon (pronounced sal-ee-leemon) on my last visit but this time I decided to try the quesadillas since I wasn’t as hungry. They’re currently renovating their restaurant and expanding it. Well they were last month anyway so I’m not sure if they’re finished now. I had the Cheese and Lamb marinated in cilantro Quesadilla. 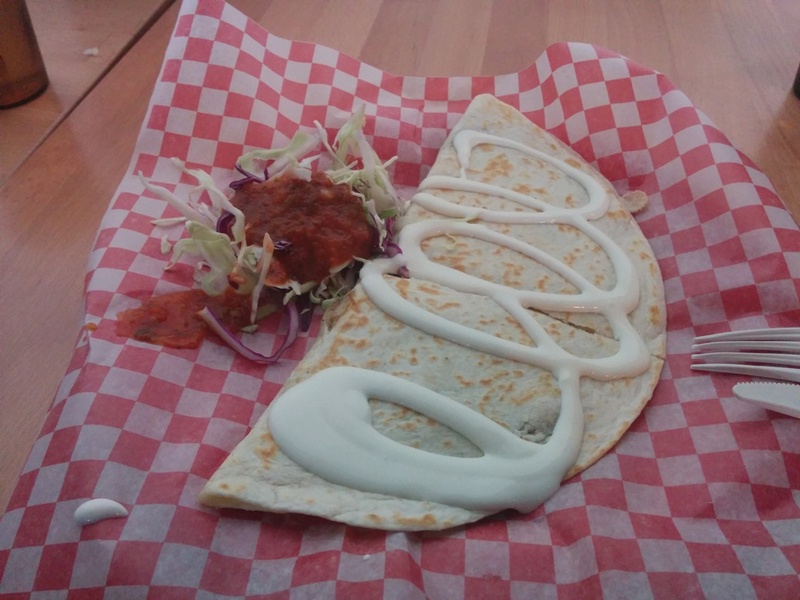 The quesadilla came with a generous amount of sour cream and the lamb filling was smooth, adequately cheesy and well marinated! I also added a bit of their diabla sauce on top and it was super spicy! Spicy as in my lips were going numb and my nose was running but now I that know what it tastes like, I can opt for a less spicy sauce next time.There was also a small side salad that didn’t look appetizing and it had some sort of tomato sauce/salsa on it and I didn’t end up eating it. They usually have a small line up but service is efficient. Seating is pretty tight though but food is cheap! Read about my last visit here. This entry was posted in Food Reviews, Mexican/South American and tagged burritos, quesadilla.